We lost both of our hives this last winter. Why… any number of reasons, but I think too much moisture was a big one. We had 17.68” of rain between October 1 (when we begin our “water year”) and May 1 – which is way above normal for us. We have had only 1.17” since May 1. It was a very wet winter and spring with several episodes of gale-force winds strong enough to break branches in our old fir tree. Losing the bees was very sad. My whole garden has been inspired by them. 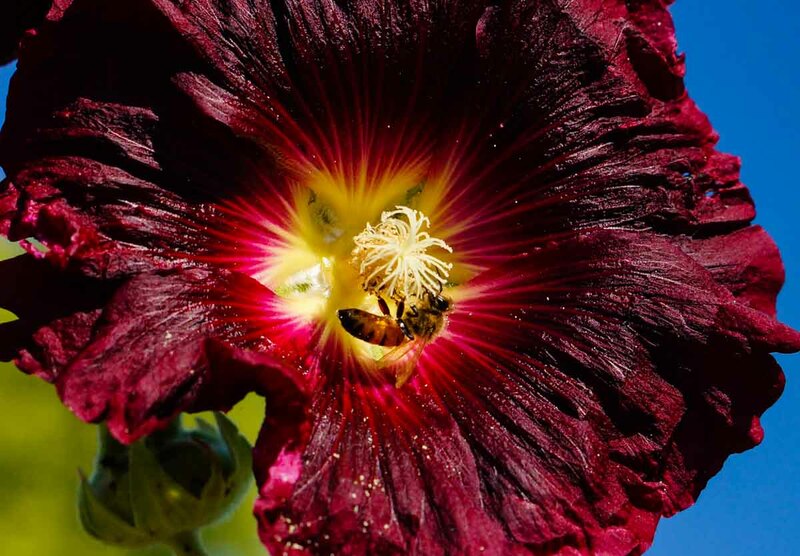 Through them, I have learned so much about the interaction between plants and pollinators. Through them, I also learned a lot about the importance of our native bees, as well as other pollinators. Saving the bees had become “my purpose,” and creating a paradise for them, growing all the medicinal herbs they might need to make their own medicine and be strong, and ensuring that something was blooming from early spring to late fall was my ultimate goal. It was a hard thing to accept. One hive looked like they just got up and left. They left me with the honey. Lots of it. I was grateful and gave thanks. I remembered our neighbor saying he was starting up new hives and baiting them with irresistible pheromones. Sneaky tactics… but, of course, I had no such proof; nor was I blaming. If anything, I realized I needed to do some introspection. In the meantime, Now what? Would the trees and berries get pollinated? I needed my bees, didn’t I? (These were the same bees that sent me to the ER; apparently I am developing a sensitivity to the venom. Hence the question, do I really need this?) I felt a twinge of mixed feelings. When I had 6 hives, I wondered whether it was too many for the area. How could I better understand the carrying capacity for that many bees and those of nearby apiaries? What about the native pollinators? How much food do the honey bees take that would otherwise support their populations? I was contemplating the meaning of all this, whether I was doing the right thing or that in so doing, the wrong thing, and the bottom line, whether or not I’d see a significant drop in fruit production, when I stood up and listened: there was a lot of humming going on in the garden. Not a swarm. Just bees. LOTS of bees, all busy foraging. To backtrack just a bit: last year, I put a lot of effort into restoring a little area around a small hand-dug pond. It had been a beautiful little garden spot with a wide variety of plants and a fun little hiding place in the back, but it had become so overgrown with grasses and morning glory, that I worried whether anything was salvageable. I cleaned it all out, relieved that I had rescued the aronia and native huckleberries, put down several inches of compost, and topped it with woodchips. I planted new plants along the outer edges that would appreciate the full sun and a somewhat drier ground; the areas to the rear got a lot more shade because of the shrubs that had by now grown quite large. To complete the restoration, I linked everything with 5 separate drip-line systems that could easily be adjusted to individual needs. I could feel the plants expressing gratitude. It was beautiful and promising and I was full of hope. This is a LOT of mustards! Looks like in the process of "cleaning out," I just planted more weeds. You can't even see what's in there. Oh, but look! The bees are loving it! I can't pull it out now! 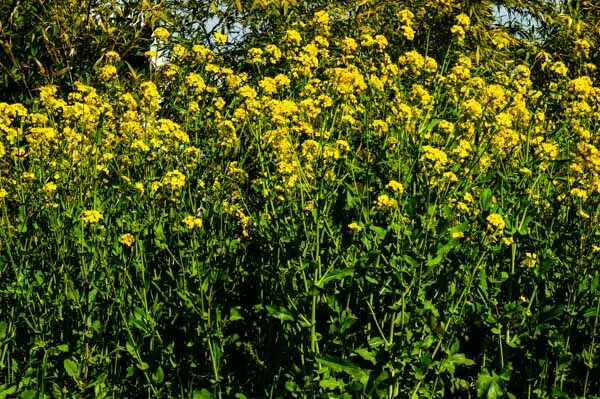 The mustard/brassica family is an important food source in early spring. The pretty flowers quickly turned to massive seedpods. Uh Oh! I am in a seed-load of trouble! Better get rid of these quick or my problems are just beginning! So, I got busy. I cleaned out the old hive. I swapped out the bottom board, which had a screen for ventilation and a removable drawer, with a simpler version from our earlier designs. I liked the screen, but I found that the bees had difficulty removing their deceased, which would pile up on it over time. Simpler is often better. Emil Warré kept his original design ultimately simple with the bottom box flat on the landing. We have since complicated things for our own convenience. 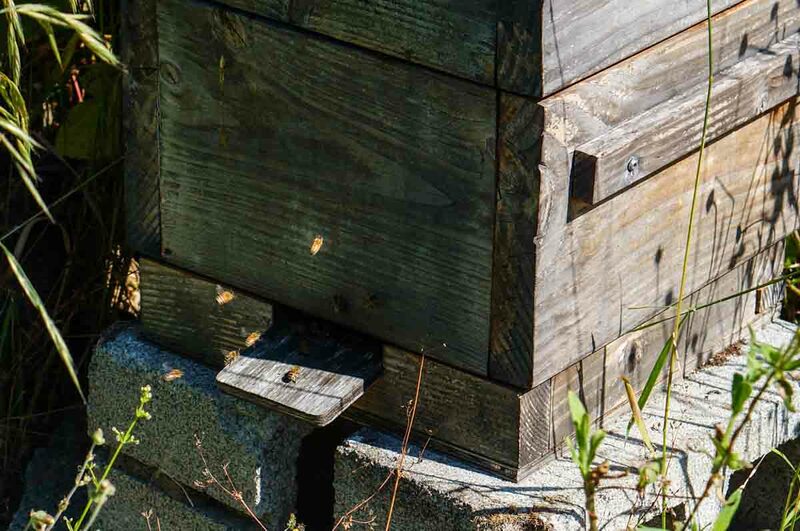 I set the hive out in the sun, away from the previous location, which was now shaded by trees and shrubs that had grown significantly in the past few years. 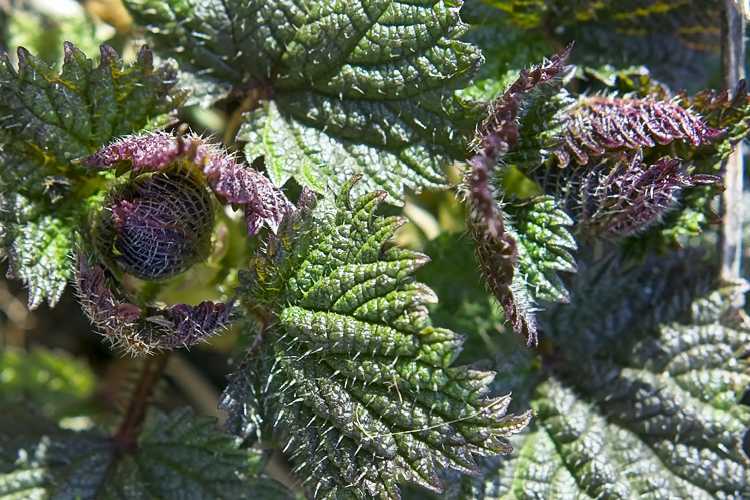 There is a huge Himalayan blackberry bramble behind the new spot, which I knew would be a strong attractant. Some scouts were checking it out in no time. I was hesitant to be hopeful. Bees moved into the Warre Hive, all by themselves. Go figure! At some point when I wasn’t looking, bees moved in. I stopped in my tracks one day. Lo and behold! There was a bunch outside the door doing an orientation dance! I was ecstatic! At this point, I can confirm that they are doing well, hatching brood, and building stores for winter. That was the easiest swarm I’ve ever not caught. Perhaps it’s better when they make their own group decision. So – at least for now, we are back in business (although I’m not really selling anything). I spend a lot of time watching them. I make sure they have water in this heat. They seem to know I am there to help, not to harm. But with “keeping” bees – or at least, providing them a home – there comes a certain responsibility. We have now crossed over the holiday of Lammas (pronounced like Thomas), also known as Lughnasad (loo-noss’-sid), the midpoint between summer solstice and fall equinox. For the ancient Celts, it was a time of harvest, celebrated with the making of the first loaves of bread with the new wheat. 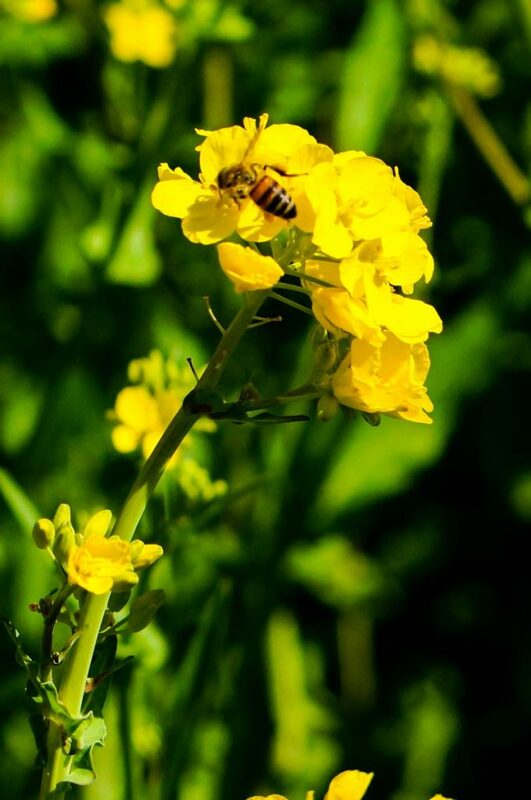 For the bees, however, rather than abundance, it is entering the time of scarcity, i.e., the dreaded dearth. Change is in the air. We already notice the days getting much shorter; the geese are gathering overhead. Though the days are still warm, mornings are often cool and moist with fog. There is not a drop of rain in sight, and the land is looking parched. Nectar-filled spring flowers that produced the berries of June, July, and August are now long gone. 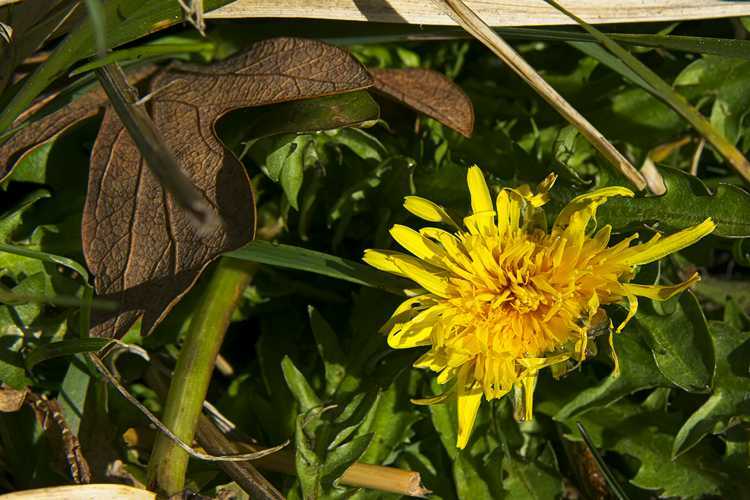 Many other annual flowers are pushing to produce viable seed before the cold hits in earnest. It is a bit perplexing; flowers seem to be blooming everywhere – certainly not like when the blackberries and cherries were in bloom – but there is still lots of color out there. The real question is, however, do they provide nectar? The late summer dearth can hit a hive harder than winter. It can drive honey bees (and their kin, wasps and hornets) to desperate robbing. Feeding is one option, but if you do, you may attract unwanteds to the hive or give the queen a false sense of abundance. Populations are at a height in summer, and all those mouths still need to eat. Normally, knowing the food supply tapers in late summer, the queen will reduce egg-laying. 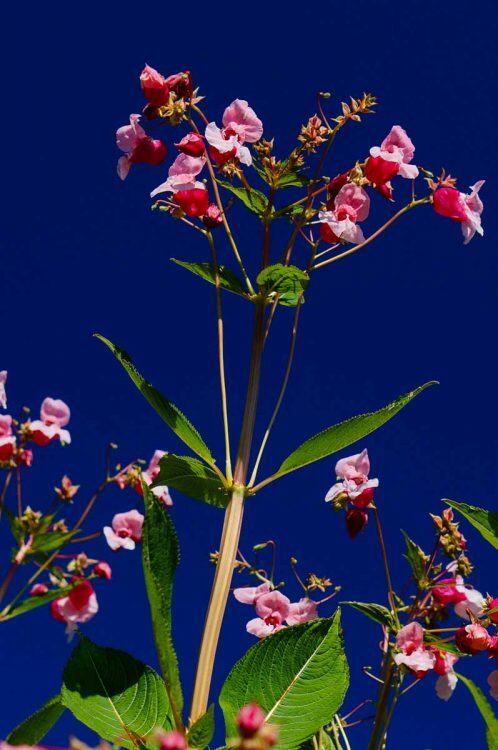 Impatiens glandulifera, "Poor Man's Orchid," a good late-summer bloomer but invasive. I did a little garden walk to see where the bees are hanging out the most. Certainly, all of the Mediterranean herbs, such as rosemary, sage (about done at this point), marjoram, oreganos, and thymes (some varieties are done blooming, but with trimming will sometimes bloom again), are big favorites. 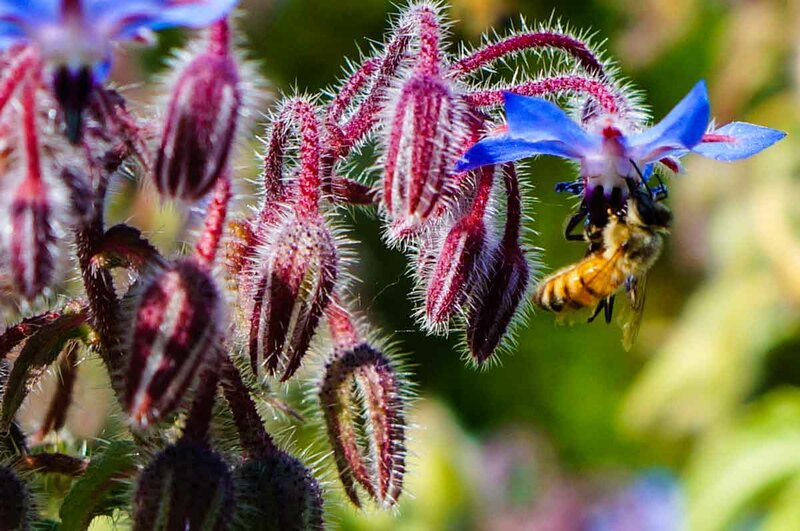 Additional plants that I will always grow for the bees are borage, catnip, hollyhocks, and lavenders. These plants often seem to be pulsating, they have so many bees going in and out of their flowers. There are a few invasive plants in the garden that I can’t recommend but have to admit are bee favorites. The most striking at the moment is the Impatiens glandulifera. 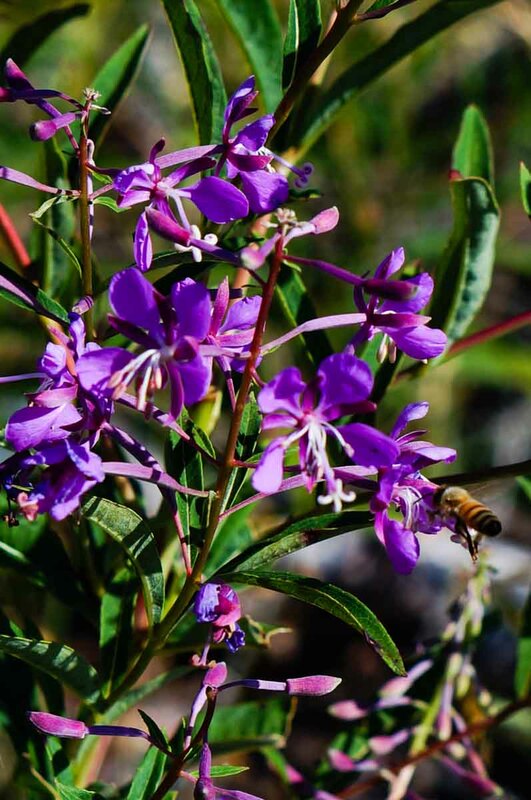 Also known as “Poor Man’s Orchid” and “Himalayan Balsam,” this bee-lover is classified as a noxious weed in WA State and has been quite invasive through much of North America and Europe. 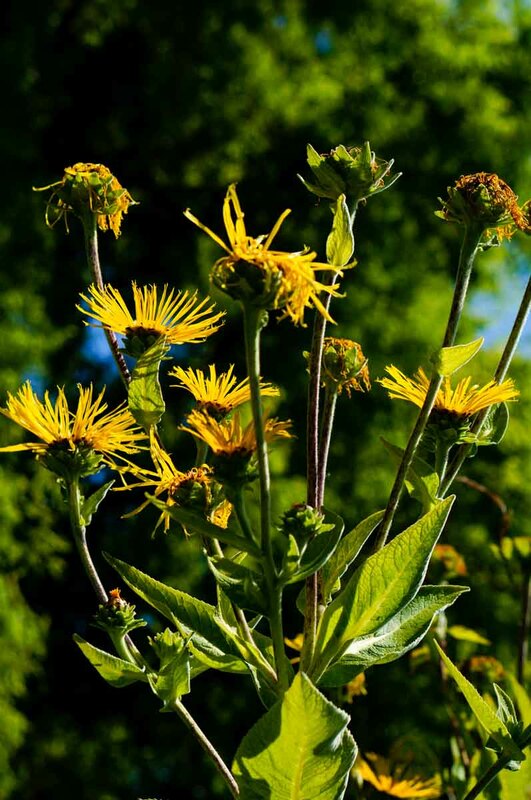 It grows super tall, super fast, with a hollow thick stem that loves plenty of water. If you touch the seed pod, it explodes! 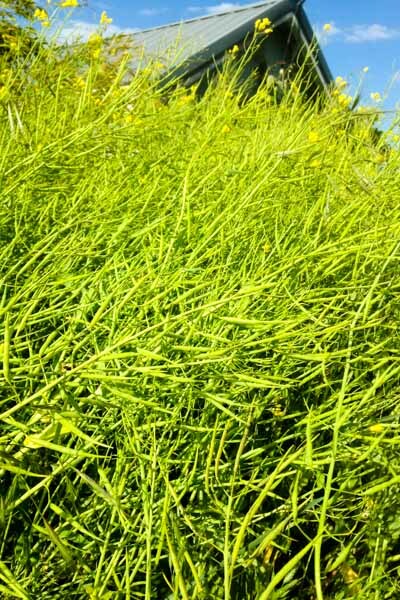 According to some sources, it can hurl seeds over 20 feet! 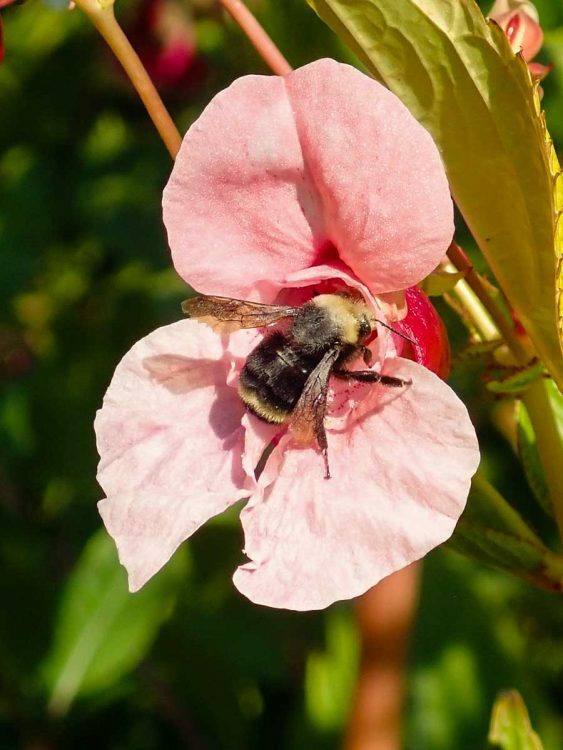 A fat bumblebee can crawl and disappear all the way inside its snapdragon-like flower, emerging covered with pollen – and this they do from dawn until dusk. The following is a list of late-summer bloomers in our garden that will provide needed nourishment for honey bees and other pollinators. 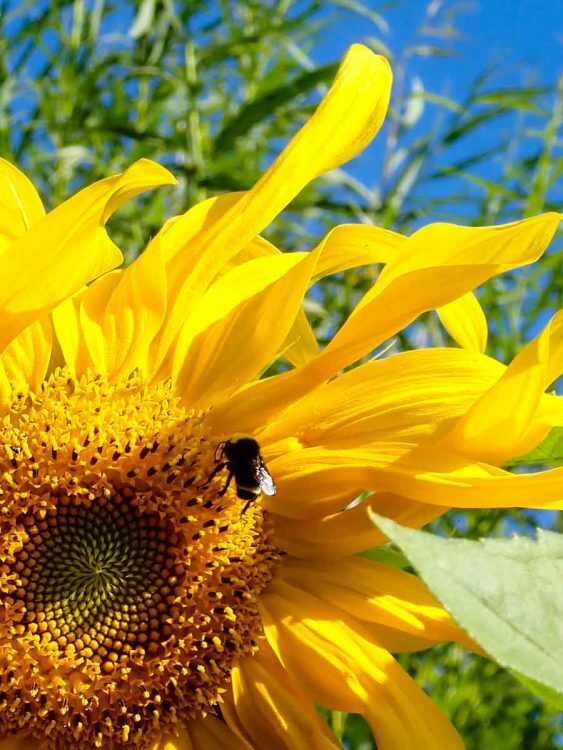 Sunflowers are an important late-summer flower for providing pollen and nectar when food starts to get scarce. It seems like a lot, but I could certainly do more. I could plant more buckwheat as groundcovers and soil enhancers. I could do a better job of deadheading flowers to extend the bloom. I could plant more of everything. (Not that I need an excuse to plant more plants!) The artichokes, asters, cardoons, Maximilian sunflowers, and pineapple sages have not yet started to bloom, so they will be welcome additions to the late-summer garden. 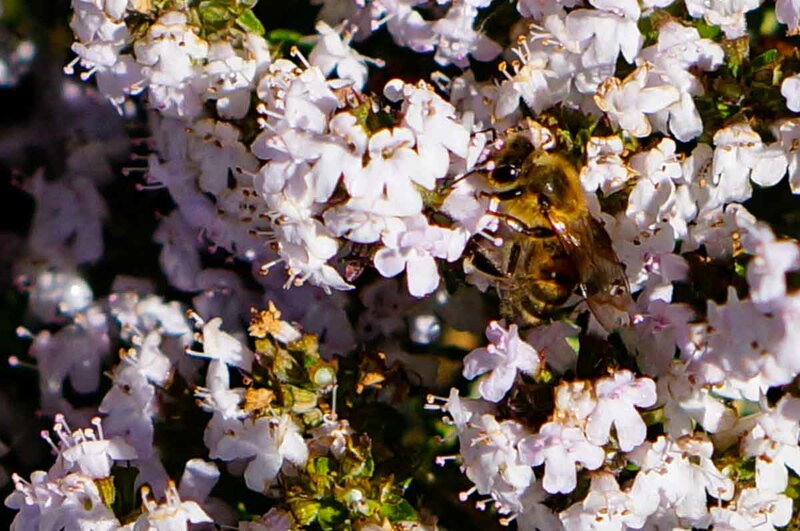 Of course, there are a lot of other things blooming, too, but those listed are where I see the most bees. I used to have more Dahlias (open-faced varieties), Rudbeckia, and Tithonia, all good late-summer / early-fall blooming plants, and ones that I’d like to bring back. I am not currently growing the medicinal herbs Boneset (Eupatorium perfoliatum) or Culver’s Root (Veronicastrum virginicum), which are purportedly good bee plants, nor any Hebe varieties or any of the Globe Thistles (Echinops / Eryngium) to any extent, although we certainly have plenty of other thistles (sigh!). 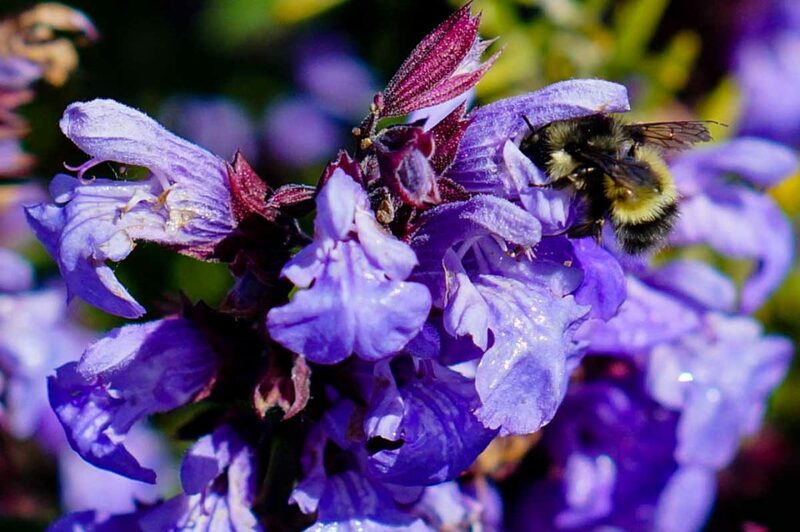 Where are you finding bees right now? What are your plans for next year’s garden? P.S. To the earlier question, “Would we see a significant drop in fruit production?” – the answer is Not at All! The cherries, apples, goumis, gojis, raspberries, blackberries, currants, gooseberries, Cornelian cherries, peas, zucchinis, squashes, and so much more…. are absolutely loaded. Thank you bees for this abundance! Welcome home! Wow, Blythe, what a terrific blog post! I WANT some “Poor Man’s Orchid! Hahaha! 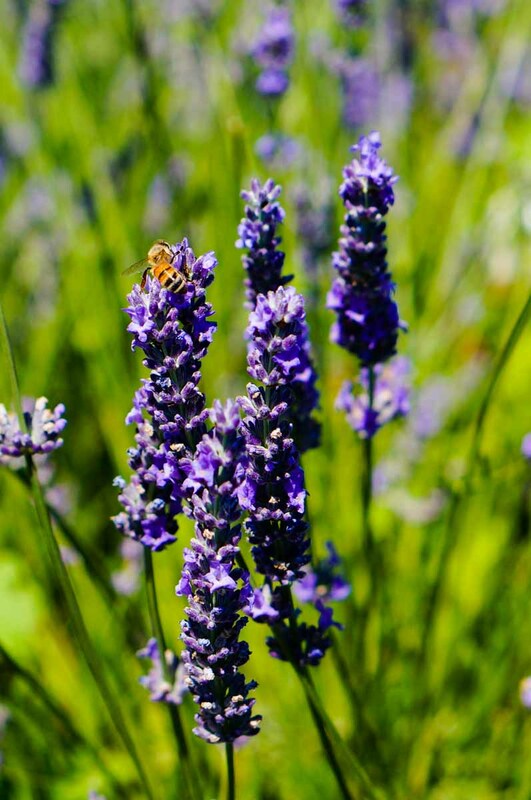 The honey bees are thick on my lavender plants right now. Still working over my Linaria and loving my Holly Hocks as well. Thanks for all this wonderful info. Maybe some day I will figure out where to put a hive…. Glad you like, Sidney. Let me know if you decide to get a hive. We have some used ones if you are interested. I forgot to add the Butterfly Weed, also invasive, and threatening to take over our barn every year. Hmmm… I might need to add some Linaria to the menagerie….